This week I take a look at ways to brew great beer while cutting down the time needed for fermentation and aging. A few weeks ago in part 1, I covered how to save time during your all grain brew day by overlapping steps and minimizing time wasted. The first step to rapid brewing starts when you select your yeast. Yeasts rated with high flocculation will clear sooner. Flocculation is a fancy term to describe how fast the yeast will form clumps and fall out of the beer as sediment. High flocculation yeast will clear quicker. Also yeasts with high attenuation tend to ferment rapidly, so high attenuation is a second item to look at when selecting yeast. Using clarity aids at the end of the boil like Irish Moss or Whirlfloc can also help your beer sediment more quickly, so use them at the end of the boil to help clear your beer more quickly. Proper aeration – adding oxygen to your wort – will decrease the lag time and result in a stronger fermentation and healthy yeast. There are many methods for aerating your wort after the boil including simple methods like shaking/stirring, the use of a aquarium pump and the use of pure bottled oxygen. The latter two methods will impart more oxygen, which is important for getting your fermentation started fast. The next important step is pitching the right amount of yeast. The ideal pitch rates for yeast are relatively high – about 0.75 million cells per milliliter per point of gravity for an ale. For a lager the ideal pitch rate is almost twice as high. Pitching the right amount of yeast results in a faster start, shorter lag time, strong fermentation and healthy yeast population that will settle more quickly. It can also result in fewer off flavors and better beer. Achieving these levels of yeast often requires a yeast starter. You can calculate the size of yeast starter using a tool like BeerSmith or calculating it by hand. Prepare your starter a day or two ahead of time so the yeast is actively fermenting when you pitch it for maximum impact. Finally fermenting in the right temperature range will aid in proper fermentation. Fermenting at too high a temperature can speed fermentation slightly but will also result in fusel alcohol and off flavors. Fermenting too cold can slow fermentation. Once active fermentation has settled down and you are certain the beer has reached its final gravity, your main goal is to speed the clearing of the beer so it can be enjoyed. Primarily this is a matter of getting the remaining yeast, tannins and other sediment out of your beer so you can enjoy it. Cold crashing your beer is one method to speed sedimentation. Chill your beer to a few degrees above freezing and hold it there. The cold temperature will speed sedimentation of yeast and other debris. It will clear your beer more quickly so you can enjoy it faster. I will note that cold crashing is best used with kegged beers as it can cause carbonation issues with bottling if the yeast is chilled too much. Clarity aids can also aid in faster sedimentation. Additives such as polyclar, gelatin, and isinglass can help yeast and other sediment more quickly fall out of your beer. Finally, you can filter your beer. This is the key that many commercial beer brewers use to push beer out in just a few days. Filtering can instantly remove yeast and other sediments from your beer giving it a finished flavor very rapidly. 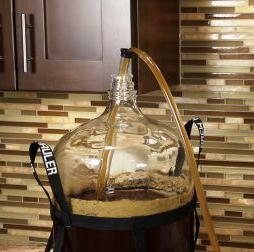 Many home brew shops sell simple in-line filter systems that let you filter your beer at home. If you have the equipment, kegging is the way to go when finishing your beer. You can keg and force carbonate your beer in just a few days, and since kegs are also usually kept refrigerated it will continue to rapidly clear your beer. In contrast, fully carbonating bottled beer can take two weeks and has to be done at higher fermentation temperatures. Once your beer is carbonated, its best to keep it cold. Again this will accelerate aging and sedimentation and let you enjoy your beer sooner. Those are my tips for enjoying your beer quickly! Thanks for joining me on the BeerSmith Home Brewing Blog. Be sure to sign up for my newsletter or my podcast (also on itunes…and youtube…and streaming radio station) for more great tips on homebrewing. Also check out the How to Brew Video series I shot with John Palmer if you want to learn more about all grain brewing. Thank you for your interesting approach to fermentation and carbonation. If one use a filter or siphon system to avoid sediment getting into the bottelling proses, how do I know enough yeast cells get into my bottles to assist with adequate carbonation?